Motorists looking for Mildura are getting lost in Murray Sunset National Park. The countless problems users have faced with Apple’s new Maps service have been widely documented since the software made its debut with iOS 6 back in September. The large majority of users — particularly those outside of the United States — have found it to be unreliable, inaccurate, and largely useless. Now Australian police have warned that using the service could get you killed. The caution comes after six motorists were guided into the wilderness when looking for the Victorian city of Mildura. When Apple introduced its new Maps service, it booted Google Maps — which had been powering Maps on iPhones, iPads, and iPod touches since the original iPhone — out of iOS. While Apple’s new app does boast some nifty features, such as 3D Flyover and turn-by-turn directions, it’s nowhere near as accurate as Google’s. And its accuracies have led to big problems for some users. 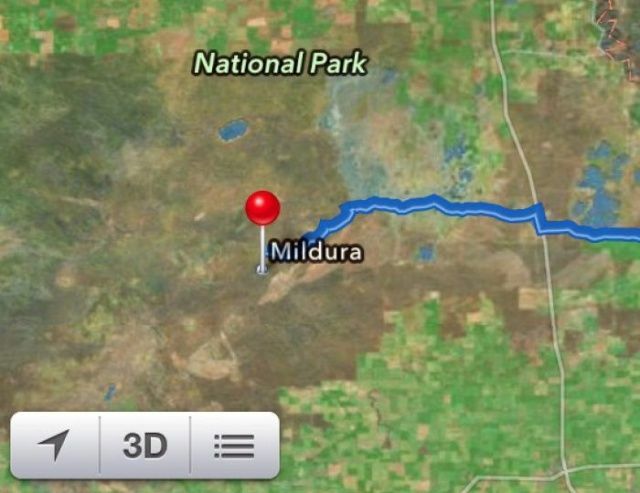 Victoria Police have revealed to ABC News Australia that in the last two months, six motorists looking for the city of Mildura have had to be rescued from the Murray Sunset National Park — which is located more than 70 kilometers away — thanks to Apple’s Maps. Inspector Simon Clemence is concerned that the service could get someone killed. Victoria Wake used Apple Maps when she was traveling with her partner from Adelaide to Mildura for a wedding two weeks ago. They ended up getting lost for five hours in Murray Sunset National Park when their car blew a type and became bogged. “We had no water, we had nothing to eat,” she said. “We had the shelter of the car, but obviously you don’t want to keep running the car and putting the air conditioner because you don’t know how long you’re going to be there. Apple fired Scott Forstall, its senior vice president of iOS software, last month after he refused to apologize for Maps problems, and the Cupertino company’s been working hard to fix them since. But despite its best efforts, Maps continues to be worthless for many users. Google is now working on a native Google Maps app for iOS, which is expected to hit the App Store soon. Providing Apple approved it, of course.